← I’m Juggling As Fast As I Can!!!!@#@!!! 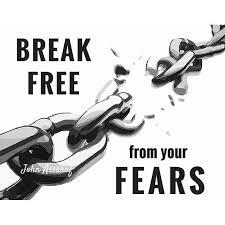 Breaking Free from Fear…YES I CAN!!! Do you let fear hold you back from your life? Do you even know if you do? Sometimes we won’t try new things for fear something will go wrong. Now it makes sense if it is sky diving, but so many other things we might try, including new careers or new relationships can be stopped before we even try them if we let fear get a grip. Fear of failure, fear of looking like an idiot, fear of people laughing at us, being embarrassed… what is your fear? There are so many versions of fear and yours can really get a hook into you if you don’t disconnect from it. So how do you do that? Is it time to break free? First, are you aware where your fear holds you back? Is it obvious? If not, really look at what you wish you could have accomplished…the road less traveled. The opportunities lost. So…what happened? Why didn’t you get that job, date that person, or let that incredible opportunity pass you by? Do you see them now? Where the fear held you back? Look for the pattern. Is it always the same fear? The same reason? Second, if it isn’t a debilitating fear or phobia, decide right now that the next time you want something you start to back away from and let that golden opportunity slip away, you’ll stop and look at it again. Decide rationally about that fear. We truly can decide to do what they say… “feel the fear and do it anyway”. We might go kicking and screaming at the beginning, but a little practice and those chances that passed you by, won’t be getting by you anymore. If you let something that appears like a wonderful opportunity get past you without even trying, you could live with the fear and regret the rest of your life…or you could take that chance, try to be brave and grab for what looks like the golden ring.